silk for caldé: Essay done! SF reading underway! 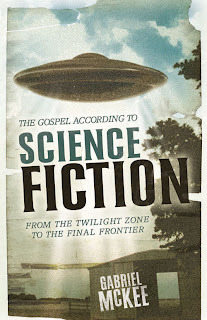 Gabriel McKee, The Gospel According to Science Fiction: From the Twilight Zone to the Final Frontier (2007). I've been following McKee's fantastic blog at sfgospel.com, and a while ago requested that my library acquire a copy of his book, and lo and behold, here it is! I read the introduction at work, and can't wait to get started on the book proper. Check out the table of contents at Amazon.com - I can't wait to read the chapters on Free Will and Divine Providence, Alien Messiahs, and Faith and Religious Experience. I'm also about a third the way through Dust by Elizabeth Bear, which I'm really enjoying. I find it rather reminiscent of Gene Wolfe's Book of the Long Sun - failing generational spaceship, AI as 'gods', religious themes, blend of fantasy and sf, needlers (needle-guns in Bear), the word 'azure'. I'll write a proper review when I've finished. On my agenda for post-semester fun: playing Oblivion and S.T.A.L.K.E.R. : Shadow of Chernobyl; re-watching Stargate SG1; planning my trip to Italy in January (I'm auditing a one month unit taught at the Monash Prato centre called "Dante's Medieval World", which my wife is taking); and reading outside in the beautiful, sunny Spring weather. Also tidying the house, though that's perhaps slightly less fun. Best Essay Writing blog. Thanks for sharing.